U.S. 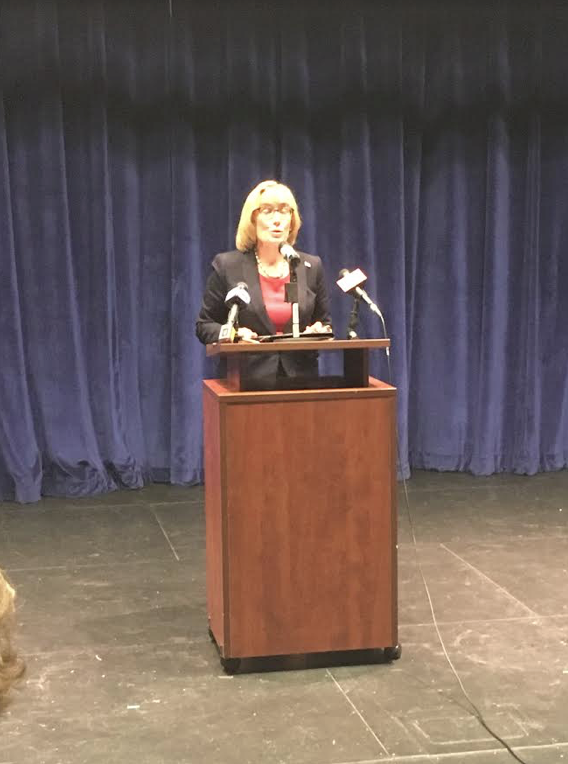 Senator Maggie Hassan spoke to students and staff in an event at HHS on Tuesday. Guns were the topic of the day at U.S. Senator Maggie Hassan’s visit to Hanover High on Tuesday. In fact, the debate over firearm laws at HHS in particular is the reason the senator came to the school in the first place. Hassan, who has served as the junior senator for New Hampshire in the United States Senate since winning election in 2016, spoke for an hour with an audience of students and staff in the crowded HHS auditorium about the issues of gun control, youth civic engagement, and the way they two have become intertwined. As she explained at the beginning of her speech, the senator had been invited to discuss gun laws at Hanover High by junior Ella Chapman following a string of notorious school shootings across the United States earlier this year. Hassan then proceeded to call for what she saw as “common sense reforms” to gun laws with bi-partisan support: more thorough background checks for those hoping to purchase firearms, the closing of loopholes allowing domestic abusers access to guns, and the introduction of a “red flag law” to take guns away from whose mental health situation made their possession of a firearm dangerous. “In this case, on this issue…we need to keep people who shouldn’t have guns from having them,” the senator stated. Oliver Minshall, a junior, proceeded to press the senator on the question how she (a Democrat) would work with the Republican Party when, in Minshall’s eyes, many Republican legislators did not want to compromise on the issue of gun control. Minshall, who identified himself as a Democrat, brought up the failure of a bipartisan deal expanding background checks created by Senators Joe Manchin (D-WV) and Pat Toomey (R-PA) to pass in Congress as an example. Hassan said that she lamented the failure of the Manchin-Toomey bill and pinned the lack of openness to compromise on the growing partisan divide in the United States. In turn, she blamed the re-drawing of states’ congressional districts to favor particular political parties (the process known as gerrymandering) as being a source of this division. She seemed optimistic about the spirit of compromise in New Hampshire (a known swing state) when referring back to bipartisan Medicaid deals passed during her time as governor. She also mentioned that the outcomes of state primary elections in 2018 would serve as key indicators in pointing out the spread or decline of political polarization. Hassan then took a question from a sophomore about her feelings on concealed carry laws. The senator voiced an opposition to concealed carry without a permit; she recounted that she vetoed two bills which would have allowed such a practice during her time as New Hampshire governor (the practice has since been made legal by her successor, current Governor Chris Sununu). Hassan said that “you have to be trained and you have to understand what you’re doing” in order to use concealed carry responsibly. She used to topic to segue into the debate about arming teachers, saying that many of the educators who had spoken to her did not wish to have a firearm in the classroom. The conversation took a sharp turn when another junior began to ask Hassan about her thoughts on the federal investigation into whether the Russian government interfered with elections across the United States in 2016. “It is very clear that Russia interfered with our elections,” Hassan said, then citing a statement made by other members of Congress alleging Russian support for US President Donald Trump’s candidacy. She also said that it was important that Congress “protect” special counsel Robert Mueller and Deputy Attorney General Rod Rosenstein, two leading officials in the investigation. Hassan left at 3:00pm after taking a few more questions.